It had been a week since I’d visited my favorite place, Bok Tower Gardens. Puttering in my own garden wasn’t enough. I needed to walk in nature too. 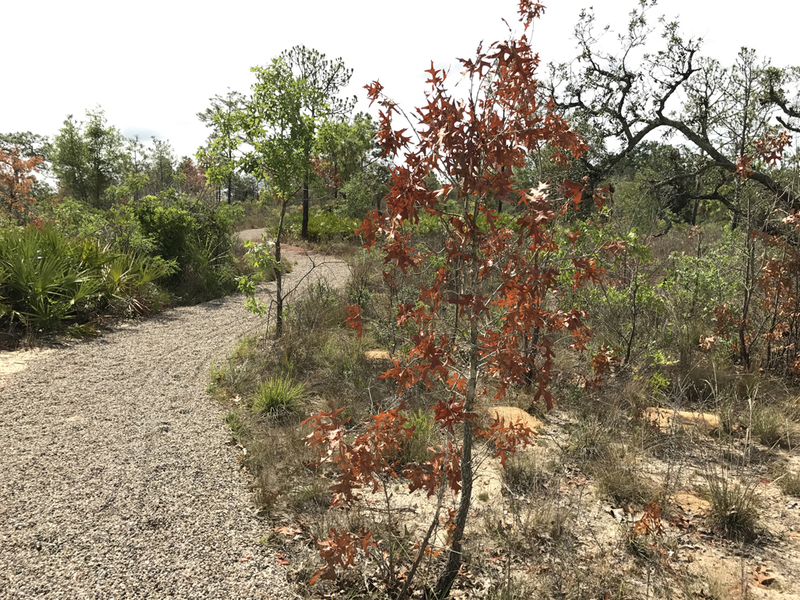 On the way to the grocery, I took a side trip to the public garden, handed over my membership card at the front gate, drove the winding road past citrus groves, longleaf pine forest, and parked beneath the shade of a live oak. Opening my door in the climate controlled environment I was assaulted by the air heavy with humidity from the previous day’s much-needed rain. Quickly I grabbed my backpack, stuffed in my wallet and pocketed the iPhone. As I walked under the arch with the quote, “Make you the world a bit better or more beautiful because you have lived in it,” I pondered my own life. This quote had been a part of the gardens since it opened in 1928. As a child, I read it in various locations every time my family and I visited. Perhaps it influenced my lifelong love of gardening, especially flowers. Or maybe this place calls me because I have the same philosophy. I just knew I was happy to be in the midst of the beauty this garden offered. As I continued along the walkway outside the visitor center, the “What’s in Bloom” table caught my attention. My head bent, I inhaled the heady aroma of the gardenias in a vase flanked by pentas and firebush, picked that morning from the gardens by one of the many volunteers. Sometimes I would spend my visit hunting for the blooms on the table. Instead I felt I needed to forgo formal gardens and walk among the native plants. Just past the Pollinator Garden, I entered the large oval, my first intersection. I checked my inner voice for direction. It led me left, fragrance once again pulling me forward toward a towering Southern Magnolia tree. 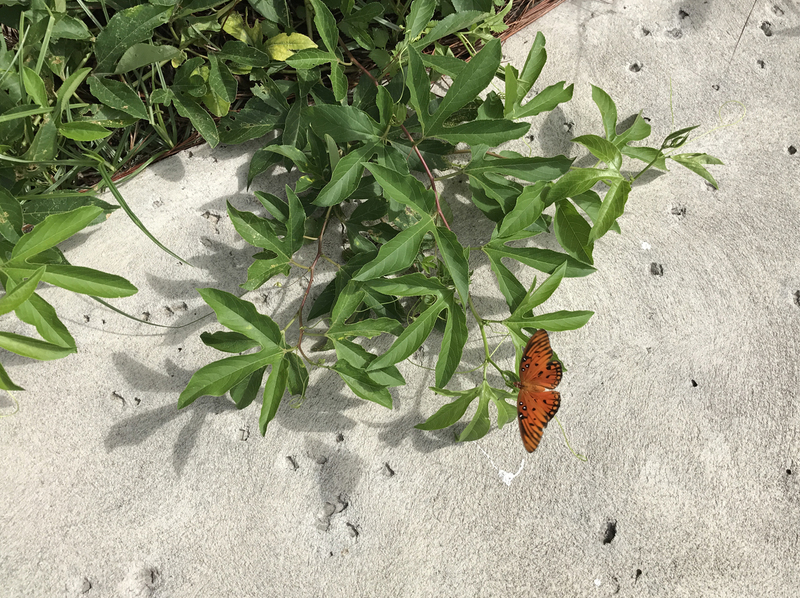 As I continued toward the wild gardens I saw Gulf Fritllary butterflies as they flitted about above the native purple passionflower vine, Passiflora incarnata. I looked under the leaves with holes eaten hoping to find a caterpillar, bright orange with black spines, without success. The adults, however, gifted me with opportunities to photograph them, pausing just long enough to snap these portraits. On the edge of the Wild Garden I heard the “Chee-wink” call of an Eastern Towhee. It brought back memories of my grandmother who lived next door. She taught me the names of all the flowers in her garden and the feathered visitors. The call of the Towhee always made her smile. As I searched nearby trees I found the less colorful female perched on the limb of a sumac, the male furiously vying for her attention. Next my wanderings led me into the nearby bog where carnivorous pitcher plants fed on hapless flies and ants. 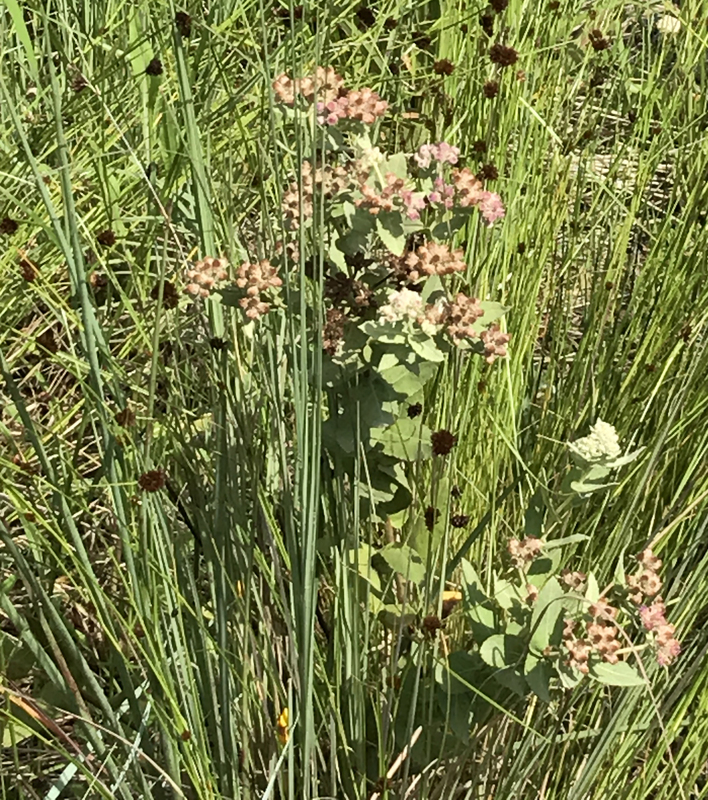 A native milkweed bloomed among the native grasses, the leaves a larval food for the Monarch Butterfly progeny. It reminded me how vital it is to include native plants in the home landscape, natives for natives. Bees, wasps, moths, butterflies, and birds are all dependent on native plants for food and shelter. As homes replace the native meadows, bogs, and forests, we help the native animals survive when we add native plants to our gardens. How are Native Gardens and Designed Gardens Different? Finishing out my hour in nature, I walked the gravel section of the Pine Ridge Nature Trail. I was surprised to see Turkey Oak leaves turning red in June and realized it was the current drought that forced these trees into early dormancy. The trail wound back into the Edible Garden joining the main trail toward the Visitor Center and entrance. My spirit renewed and a little damp with perspiration, I paused to drink water from my day pack, and turned back toward my car and the resumption of my morning errands. As I parked under a strip mall parking lot tree, the prospect of my errands seemed lighter and my smile brighter as I gathered my reusable bags, and entered the local Publix grocery, where “shopping is always a pleasure”, especially after a visit to the garden. 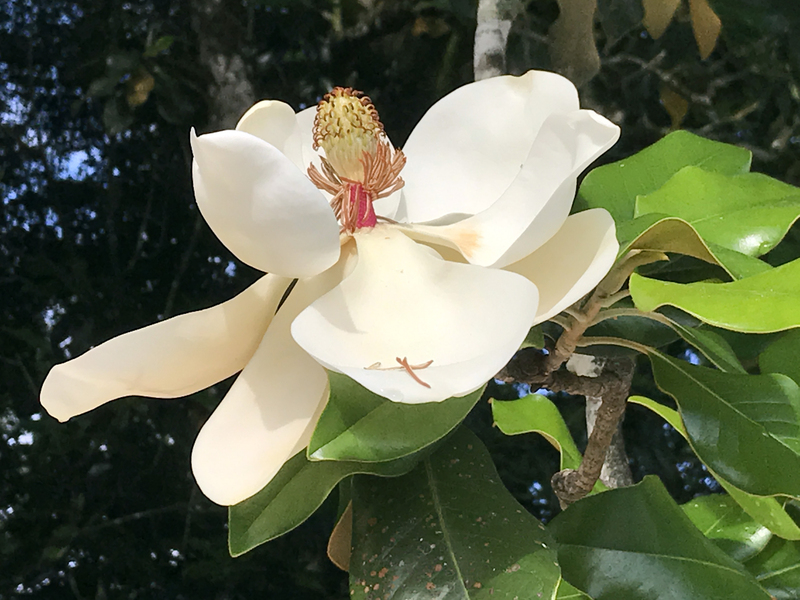 As I wandered along the paved path at Bok Tower Gardens having just finished leading a garden tour, I slowed as I passed the Tea Olive bushes, sniffing the air to catch the beautiful scent I had enjoyed all winter. But the flowers were gone. I filed away this seasonal change in my plan to add it to my home landscape. Just ahead I saw two young women discussing the blossom on a Monstera deliciosa. Holes speckled the large leaves giving it the common name “Swiss Cheese Plant”. As I passed by I overheard a retired couple slightly ahead discussing the similarities of some of the semi-tropical plants to the temperate ground cover in the native forests near their northern home. They were deep in conversation and walking about the same pace as myself. As usual, I was looking all around, on the ground, in the distance, down side paths and into the trees hoping to spot an unusual blossom, a butterfly or the source of a bird’s song. I was slightly startled to see a sizable black snake resting on top the bromeliads six inches off the trail just beyond the Monstera. His smooth black body coiled atop the light green plants was a study in contrast, hard to miss. Yet the two women and the older couple had walked right by without seeing him. I felt honored to share a few moments with this Florida native. His tongue was busy flicking in and out, testing for the possibility of prey. As I slowly walked past him to get a good look at his head, he became perfectly still. This lovely reptile appeared to be a black racer, hoping to find a tree frog feeding on mosquito larvae in the cups made by the leaves of the bromeliads. I snapped some photos and then thanked him for being such a great model before heading down the path toward a yummy ice cream cone at the Blue Palmetto Café.